Shrike is another ninja who dresses in a similar fashion to Kage, although the colour of his outfit is red rather than black. It is unclear what exactly their personal connection is, but it is apparent that they know each other pretty well. Shrike, just like Kage, is a member of the Ninja Guild located in Ikrihil. Nevertheless, he is greatly frowned upon by his fellow ninjas, due to the fact that he does not follow the guild's ethical code at all. Shrike is currently in service of Fright, an evil overlord set on conquering the entire world. While it's not uncommon for a ruler to enlist the aid of ninjas - for instance, both Grubmil and Lendarra have hired Kage - working for someone who is truly evil is not tolerated by the Ninja Guild. As part of Fright's team, Shrike is mostly charged with espionage or stealth missions. Whenever Fright needs information about something, he asks Shrike to take care of it. 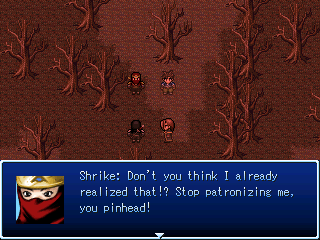 Because Shrike is excellent at attacking foes by surprise he's also a brilliant assassin. Late in the game, Kage and Shrike run into each other a number of times. Kage, who is upset over Shrike's violation of the Ninja Guild's code, wants to punish Shrike for this. This results in a number of duels, of which the last one is a duel to death. Depending on who wins this duel, you can (re-)recruit either Kage or Shrike. In other words, you can never have both of them in a single playthrough. 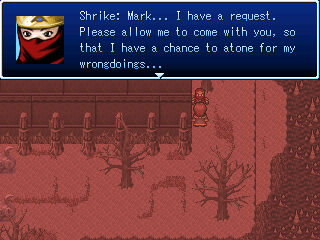 Combat-wise, Shrike is essentially the same as Kage. 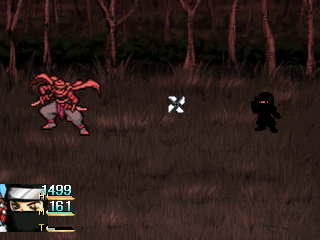 But whereas Kage starts with a dark-elemental jutsu, Shrike's starting element is fire. Their stats also differ, although only slightly. Kage is a stronger fighter, while Shrike is better with magic. Additionally, Kage is a little bit faster, while Shrike is better at defending himself.